I posted it to Twitter and copied the tweet to a couple of local news organizations, thinking they might want to use it for online galleries. But of course, as things often do on the internet, it took off and I've been flooded with replies, emails, Facebook comments, etc! I got a call from the Director of Public Affairs at UT and they will be handling any of the licensing that may arise. He said they were going to contact the AP (!!) so who knows? Since I took the photo at work it really is UT's to do with as they wish, I just want credit (which I know they will honor) - I can't wait to see where the image pops up! 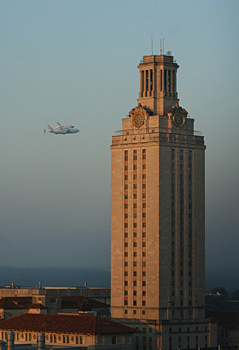 Still kind of blown away by the reaction... And ultimately I'm just really happy that I got to see the shuttle! !